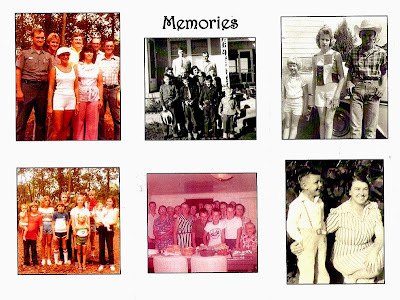 More Family Photos: Do you know who they are? 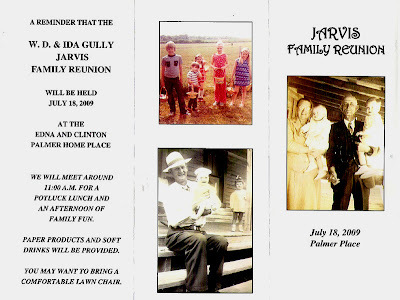 The Jarvis Family Reunion was held this year at the Clinton and Edna Palmer family homeplace. Since her retirement, Sara has spent a lot of time and has made additions and improvements to the house she now calls home. It was a perfect opportunity to showcase all the changes and gave many the opportunity to see it for the first time. Thank you, Sara for your hospitality and hard work in putting the reunion together this year. Thank you all for making it such a special day. It was a perfect day for a family get together. The weather was perfect, not to hot with a nice breeze for most of the day. The food was spectacular, as usual. And the opportunity to see and visit with everyone was as they say in the commercials "Priceless". For those that were unable to attend, I will try to put a sampling of the pictures on the blog. We missed all those that were unable to attend and hope to see you next year. Elliot and I will eventually get around to updating the blog with pictures and news from the 2009 Family Reunion. If you would like something included on this page, please email us by clicking the links below! Kook Tales ~ Tales of the Kookiest Kooks!